Dove Hunting Tips - Tips on Improving Dove Shooting. Be prepared with your hunting gear and know that dove hunting in Argentina - Uruguay is high volume dove hunting. Peru dove hunting can be compared to the dove hunting in Mexico. But no less, preparation with your good shooting glove, ammo pack, favorite shotgun or 2, shooting glasses, ear protection, and cap for the sunlight are all just basics for any good dove hunt. Yes, keep some bottled water with you especially when dove hunting during the summer months of January and February, but Los Gauchos shares this tip for our fellow wing-shooters. Look for a watering hole - small pond, mud puddle or stream near the field. This can be a hotspot for the dove shooting. You will have some easy shots and a good volume of doves. Don't go cheap with dove hunting in Argentina, Uruguay or Peru. Yes, we are all looking for the best deal, but for dove hunting, you "get what you pay for". Typically a low priced dove hunt means low quality hunting gear, including shotgun shells, which are a large part of the Argentina dove hunt and Uruguay dove hunt. Be wary of FREE shells. Again, sounds enticing, but many times these are the lowest quality shotgun shells with inferior ingredients and while easy on the wallet, they will also be easy on the birds. You will sacrifice a lot with low priced too good to be true dove hunts in Cordoba or Uruguay. In the end you will spend just as much if not more, in addition to some frustrating shooting with outfitters that offer low priced cheap hunts that include cheap, low quality hunting gear and ammunition. 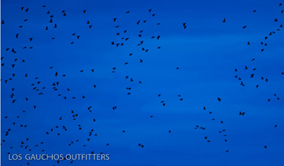 A low priced hunt may also mean some long afternoons staring at a vacant sky. Not why you booked a dove hunting trip to Argentina. You came for the birds, and remember, you get what you pay for. So, be careful with the SPECIALS and FREE SHELLS that many outfitters offer. Dove hunting tips for hunting in South America do not differ much from the normal dove hunting tactics used throughout the rest of the world. Like most successful hunting - pre-trip scouting, planning, and preparations stack the deck in your favor of having a great day in the field. Those hunters that skip the pre - hunt prep leave their results to chance. Argentina dove hunting is a high volume hunt, so preparation and some brush up on shooting tips should be taken. Los Gauchos offers Argentina dove hunting AND Uruguay dove hunting, so practice your shooting and get ready for some fast action, high volume dove hunting in South America. One study revealed that an average of eight shots are taken for every dove bagged. Doves from Texas on down to Argentina have an elusive flight that accounts for this startling statistic. The good thing about dove hunting in Argentina and Uruguay, is the number of doves and the variation of the dove's flight. You will have such a high volume shoot that and the doves will continue to fly with all kinds of opportunity to shoot. So, don't let a bad opening day of Texas dove hunting get you down. Just head down to Argentina or Uruguay and enjoy everyday like it was opening day in the dove fields. These tips for dove hunting in Argentina, Uruguay and Peru can also apply to dove hunting in Texas or Mexico. One question every wing shooter asks (and answers) is the perfect dove gun - what is it. Basically you can shoot doves with any kind of smoothbore. We have clients that shoot with 12 gauge "duck hunting" guns to .410 guns. But to really enjoy the dove hunting in Argentina and Uruguay, you must have the ultimate shotgun. The 20 gauge is the perfect size. 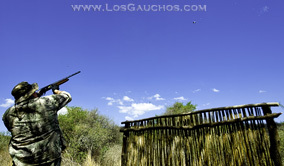 Los Gauchos Outfitters provides shotguns - 20 gauge semi-autos for all of the Uruguay dove hunts. Argentina dove hunting includes a much larger selection with the high volume shooting of just doves in Cordoba. Los Gauchos Outfitters does stay competitive and with dove hunting in Argentina that means keeping costs to a bare minimum. We are honest about our dove hunts, some fields do take 30 minutes to get to while our high priced dove hunt at the Chanares Lodge is about 5 minutes with one of the best and greatest number of dove roosts in South America. Dove hunting in Argentina and Uruguay as well as Peru is an international hunting trip, so it is more than just a day of shooting doves. The lodge, the meals, the service, and the hunting guides are all a large part of the dove hunting trip. Los Gauchos prices our dove hunts right - we give you the highest quality hunting gear, the highest quality hunting lodges, an affordable comfortable hunting lodge is so desired, and some of the best dove hunting in Argentina and Uruguay. We have options and are happy to discuss the dove hunting destinations with you. We hope you apply these hunting tips to your dove shoots in the years to come with great odds of success for dove hunting in Argentina, Uruguay and Peru. Fortunately, great dove hunting outfitters in Argentina have done the scouting and legwork for you prior to the hunt. The best thing that you can do for yourself is to have the discipline to read all of the outfitters pre trip instructions carefully, bring exactly which items are recommended for a successful hunt, and by all means ask questions if you are unsure of anything. There are no dumb questions on international wingshooting trips. However, you will feel dumb if your fail to prepare properly and end up not being able to enjoy, or complete your hunt because of your error. 1 Come prepared. Read the pre-trip paperwork, ask the outfitter questions such as who will meet us at the airport. Who do I call if no one is there. How do I pay for shotgun shells. Can I bring my own shotgun for my dove hunting trip. Pack the essentials such as sunscreen, a hat, a good shooting glove, and some first aid for sore shoulders and hands. High volume dove hunting - the only dove hunting Los Gauchos offers! 2 Practice always helps to make perfect, so take in a weekend or night or 2 and spend at your local shooting club and practice your shooting skills with shooting clays. Many of the shooting clubs have instructors and professionals who have been to Argentina or Uruguay and can share their secrets for the best technique on dove hunting in Argentina and Uruguay. The doves fly at all altitudes so you will have a challenging shoot or you can be set up where they are flying right in front of you. If I had to think of the most common example of a lack of preparedness on a dove hunt that ending up causing a less than enjoyable trip for the client it would be the following: note: Name is changed to protect the privacy of this hunter. One of our guests, lets call him Kevin, did not take the time to read his paperwork carefully for his Uruguay dove hunt. In bold type at the bottom of the gun form - just above where he signed his name, it warned the client that the guns that are listed on this form, up to three, are the only guns that the permit that we would be arranging for him would cover. In bold type, and in italics, it stated that if he wishes to substitute a different gun, or guns, that he must complete another form and submit it to our office within ten business days of the date of his arrival. Kevin either did not read this at all, forgot it, or decided that an exception would be made for him upon arrival, and brought none of the three guns he had listed previously. He instead showed up with two very expensive double guns that were valued at over $15,000 each, only to have them confiscated by customs upon arrival. Even though Uruguay has arguably the most lenient gun entry policy of any Latin American hunting destination, the permits are issued, signed, and notarized in a government office that is located over an hour from the airport. They can't be reissued on the spot to reflect the new serial numbers, make, and model of Kevin's expensive shotguns. Only making things worse, it was Saturday. No one would be able to do anything to get him a new permit until Monday morning. Customs had no choice but to confiscate the guns until a legal permit could be obtained, or until he left the country. Even though he was not thrilled about it, after we assured Kevin that we would get his guns for him on Monday, he was able to relax into a great dove shoot using a lodge gun. A new gun permit was issued on Monday morning, and a great outfitter was able to convince customs to release the guns and it was delivered to the lodge in time for the PM shoot. Kevin was embarrassed, and swore that next time he would read the pre trip documents more carefully to avoid such a nerve wracking and expensive ordeal?the new permit and delivery of these fine double guns cost him $470. So if you want a great dove hunting tip, here it is: familiarize yourself with all of the applicable laws for the country that you are hunting in. Also, when you return home, don't forget to put the plug back in your gun. You would not make the first person that forgot, and was surprised by a game warden on an opening day spot check. The dove hunting season is not regulated in Argentina or Uruguay. You can shoot doves anytime of year. There is no limit. That is what makes Argentina and Uruguay such a prime destination for dove hunting. No bag limits for doves. You are required to have a hunting license - Los Gauchos assists with getting the license for your day of arrival. Currently the fee for entering Argentina with a shotgun is $110. You will need to complete the official gun form and hold onto it while you hunt in Argentina. You will show it upon departure. Enjoy the Argentina dove hunting experience - Enjoy the Uruguay dove hunting experience. And if you are looking to break some records, remember dove hunting is available year round and there are no limits placed on the dove shooting, so Los Gauchos will welcome you back to Argentina or Uruguay anytime. D oves in South America are high in supply but not in demand. In fact the fields and land are very valuable to Argentina and Uruguay and doves destroy the crops. So, welcome dove hunters to Argentina and Uruguay. The dove hunting is high volume and good wingshooters are wanted. Bring your dove hunting skills and equipment for high volume, high action shooting and get ready for dove hunting in Argentina and Uruguay. A rgentina dove hunting is not going away, and the volumes will not decline in the near future. So, sit back and enjoy your dove hunting trip in Argentina or Uruguay. 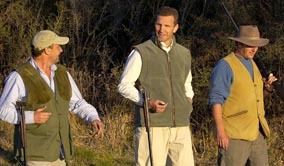 Both countries are exceptional places to enjoy the wingshooting sport and with good friends, good food, good guides, and a fantastic background with near perfect fields, if you do not break a record, you can make sure the dove hunting in Argentina is first class and Los Gauchos emphasizes the trip experience, not the number of doves you knock down.